Steve Sullivan. I hear the name and immediately think of the baker and founder of Acme Bread in Berkeley, California. Tim’s mind, on the other hand, jumps to the left wing and alternate captain of the Nashville Predators. Likewise, to me, Pecorino is a cheese. To Tim, it’s a mispronunciation of Pekka Rinne, the Pred’s goalie. For the assist in baking breadsticks, I turned to the the baker – not the butcher, the candlestick maker, nor the hockey player. I think I chose the right Steve Sullivan as the breadsticks turned out soft, chewy, and flavorful. And with a lovely open crumb to boot. 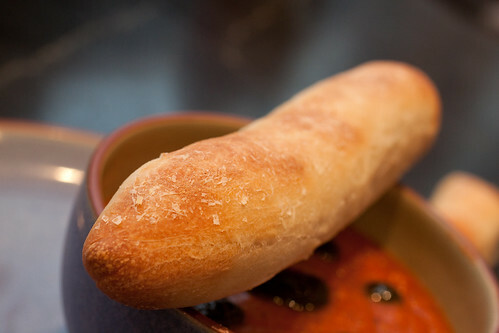 We happily dipped our breadsticks into hot bowls of tomato soup, but you could serve these with tomato sauce, extra virgin olive oil, or pesto. Add a salad to make light lunch. Add herbs and you’ve got herbed breadsticks. Add extra cheese (mozzarella, parmesan, or pecorino – the cheese, not the goalie) and ta da! – cheesesticks. Not that they any accompaniment, herbs, or cheese – I actually like them just as they are. I said you could because I’m all about options, people. 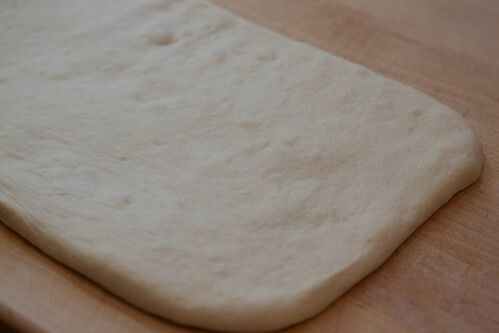 Here’s another – use the dough for pizza crust (which is what the original recipe calls for). Talk about versatile. So many uses from a single recipe. Try it and tell me what you come up with. Place the yeast in a mixer bowl and add the water, stirring to dissolve the yeast. Allow mixture to rest for about five minutes, until it turns creamy. Stir the oil into the mixture and then gradually stir in the flour, mixing until well incorporated. First Rise: Scrape down the sides of the bowl, cover, and let rise in a warm place (about 85°) for about 1½ hours, or until the sponge is very bubbly and has doubled in volume. Use a rubber spatula to deflate the sponge, which will be sticky and loose, and fit the mixer with the dough hook. Add 2 cups of the flour and the salt to the sponge and mix on low speed for 2-3 minutes. Increase the mixer speed to medium and, if the dough isn’t coming together nicely and cleaning the sides of the bowl, start cussing and throwing things. Just kidding! Instead, sprinkle in a little more flour by the spoonful. 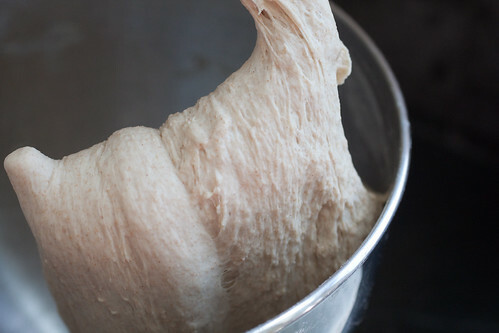 Continue to knead on medium speed for another 4-5 minutes, until the dough is smooth and elastic. Although the dough may remain moist and a little sticky, you should be able to grip it without having it stick uncomfortably to your fingers. If you find yourself in a sticky mess, add a wee bit more flour. Second Rise: Place the dough in a lightly oiled large bowl and turn it over so that its entire surface is coated with oil. Cover and let rise in a warm place (about 85°F) for 1½ hours or until doubled in bulk and holds a deep impression for a few seconds when poked with your fingers, like an innie belly button. About one hour into the second rise, preheat the oven to 475°F and place a baking stone on the bottom shelf. Shaping the Breadsticks: On a lightly floured work surface, turn out the dough. Gently pat it into a rectangle, roughly about 8 inches wide and 16 inches long. Using a long knife or pizza cutter, cut the dough crosswise into 16 strips, each about 1 inch wide. 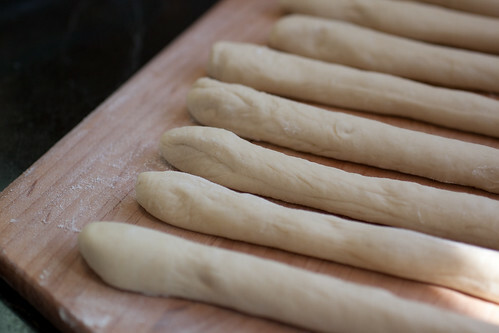 Roll the strips slightly if you want a more rounded, cigar shape to your breadsticks. You’ll probably have to bake the breadsticks 8 at a time, so keep half of them covered while you work with the other half. Lightly sprinkle a pizza peel with cornmeal and carefully lift 8 sticks onto the peel, leaving space between each one for rising. Cover the breadsticks loosely and let rest 15-20 minutes, or until slightly puffy but not doubled. 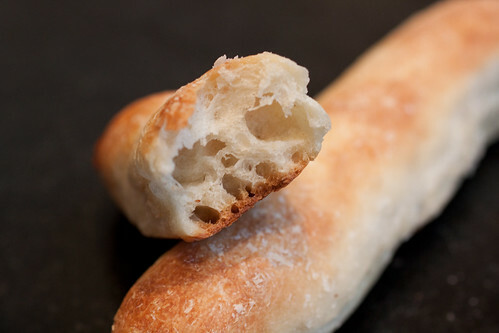 Baking and Topping: Slide the breadsticks onto the preheated baking stone and bake 13-15 minutes or until golden brown. Remove from oven and quickly brush with olive oil and sprinkle with freshly grated parmesan cheese or coarse salt. Repeat with remaining dough. Serving: Eat these immediately as they are best straight from the oven. 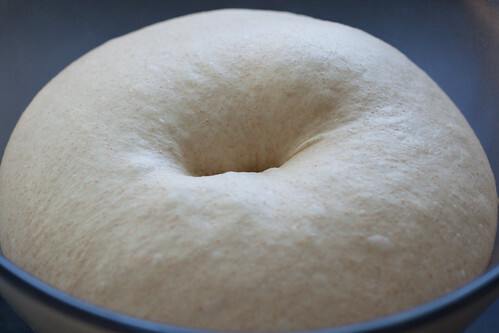 Dough Storage: If you don’t want to use all the dough at one time, wrap a portion of the dough tightly in plastic and store it in the refrigerator, where it will keep for a day or two. Or wrap it airtight and freeze it up to one month. Thaw frozen dough, still wrapped, overnight in the refrigerator. 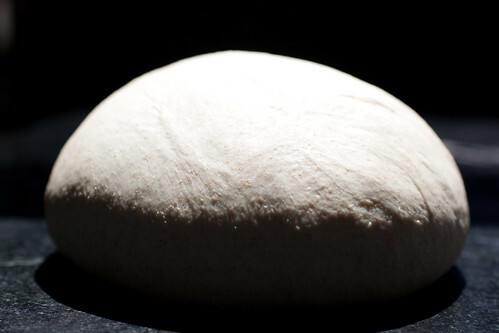 Bring chilled dough to cool room temperature before shaping. Shaping and Baking Pizzas: See here. 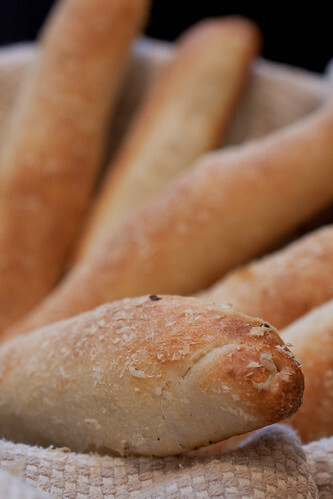 4 Responses to "Soft and Chewy Breadsticks"
Don’t laugh, but I’m on the hunt for a recipe for a homemade version of the scary-but-tasty cheese dip that often comes with breadsticks at the pizzeria. We love that stuff! We’re down to eating out for pizza once a month (used to be 3-4 times a month!) and making pizza at home the rest of the time, but these breadsticks with some of that cheesy goodness might keep us home the whole month. Don’t laugh, but we still really love going to Satco and getting queso. Trust me, I know it is not authentic cheese, but we still love it too. Jenn has made queso here a number of times, but i don’t think that’s what you’re really after. 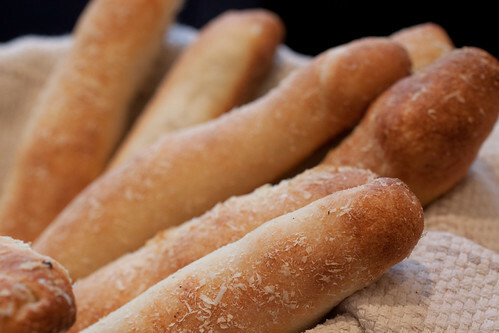 These breadsticks look perfect. Great job and thanks for sharing the recipe. Hi Angie – Perhaps this is the “scary-but-tasty” cheese sauce that you’re after.